I’ve never heard of it before today? Well, Google Analytics a web analytics solution that use a small piece of tracking code that is placed on every page of the website in the HTML code. It will tell you how many people came to your site, how they found you and what pages they looked at. With this website performance and visitor information, you can improve your website return on investment, increase conversions, and make more money online from your both your website and digital marketing campaigns. The process of improving your website performance by using this information from Google Analytics, is called Web Analytics. Every single company in today’s digital age should be measuring and tracking their website goals effectively using web analytics. Most businesses use Google Analytics as the preferred web analytics solution, mainly because the standard version is FREE to use. If your law firm is at all interested in measuring and improving the performance of your website (and you really should be!) then setting up goals in Google Analytics is the best thing to start with. Measuring success is about monitoring the leads captured and most importantly which content drives the most sales. This is because law firm websites tend to be very content driven and have lots of areas of information explaining the legal services that they provide. Below is my list of the to help them measure the performance and effectiveness of their website. Your contact form should be easily accessible throughout your website and it is probably the first place a potential client will go to make a tentative enquiry or ask for more information about your services. By tracking this goal in Google Analytics, you will be able to determine how many enquiries your website traffic generates and how you can improve the no. of people who convert to make an enquiry. Most law firms who are looking to take advantage of the benefits a website provides, will have an area on their website that allows potential clients to subscribe for more information and updates via e-mail. 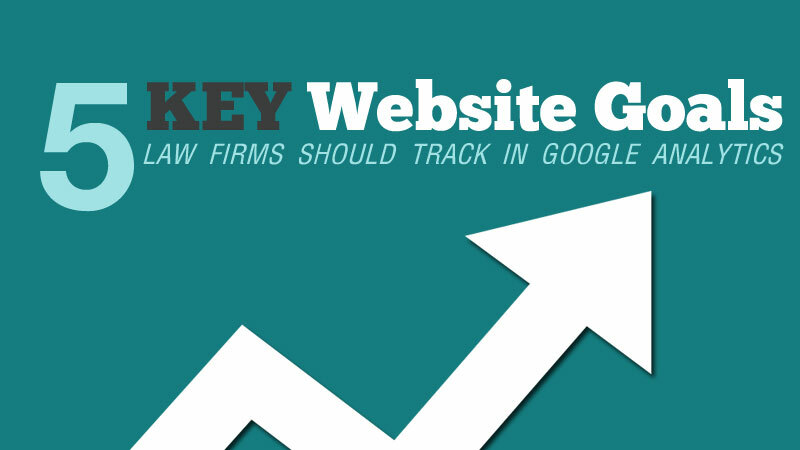 A key area of any law firm website is the available downloads of research information, marketing material or industry reports to provide further information to potential clients and interested businesses. A law firm should measure the downloads of any marketing material and reports in Google Analytics, to ensure the content that has been created is easily accessed and is useful to your visitors. A website visitor who looks at more than one page on your website is likely interested in your content. With Google Analytics, you can setup a goal that is recorded when a visitor has viewed a set number of website pages. It is important to understand engagement with your content and how useful it is to end user. You can also measure visitor engagement by looking at the bounce rate of a page. Bounce rate has been described as the ‘I came, I saw, I puke, I left’ metric. It represents the percentage of visitors who entered your site and “bounce” (leave the site) rather than continue viewing any other pages within your website. A high bounce rate can suggest your website page is not usable, badly designed, not relevant, interesting or laid out properly for the end user. Website visitors who are looking at your website for a long time, specifically staff contact details are obviously interested enough in your services, copy and marketing material that they have a genuine need to get in touch with you. This might be for some advice, or to become your client. Someone who views a number of pages and spends a while on your site is likely to be an engaged visitors who is reading your content with intent or looking for a specific service. It is important to understand engaged vistiors and to make sure people are not just spending a long time on your website because they can’t find what they are looking for. Google Analytics lets you measure time on site as a goal, you can measure a set amount of time on the website tracked e.g 5 minutes. How to Setup a Goal in Google Analytics? This video below from Google, will show you how to setup a basic goal in Google Analytics. It is best to speak to your IT Manager or Website Manager first, they will be able to apply the Google Analytics tracking code across all your website pages. I hope this post helps you with your Google Analytics tracking and if your law firm is measuring this kind of information, then you’ll be way ahead of competition! If you need any help setting up Google Analytics or would like an audit of your website performance, why don’t you get in touch with me. I’d love to help you. Original Post Credit: A quick shout to Mike Bean of at Isaac Parker for inspiring this post, who wrote a similar post here.